Why Be Afraid of Russia? Washington and Moscow Have Competing Interests. But They Can Be Overcome. Russia’s recent actions in Syria have raised new questions about the country’s foreign-policy goals and their meaning for the U.S. Doubts remain about the annexation of Crimea and how it continues to affect Russia’s plans in Europe and beyond. Moscow, meanwhile, must continue to navigate among its aspirations for great power, its sense of encirclement by a vindictive West, and a GDP held hostage by depressed energy prices. Through it all, Putin remains popular with his own citizens, even as his government has ratcheted up harassment of political opponents and minority groups. In advance of the Zócalo event, “Is Russia America’s Biggest Foreign Threat?”, we put the same question to six experts on foreign policy and Russian politics. Yes or no, what does the answer mean for U.S. politics? What should come next in our relationship with Russia? No, Russia is not America’s biggest threat—not necessarily for the lack of will, but for the lack of means. Putin’s project, writ large, is to restore Russia to what he sees as its natural, inherent position of global power and relevance. It’s foreign policy as revenge, making up for what Putin sees as all the slights and humiliations Russia suffered in the years following the Soviet collapse. America and American power become unavoidable antagonists in this project. But Putin doesn’t really have the levers to affect core American national-security interests over the long term. The Russian economy is weakening and is unlikely to rebound soon. This makes Russia a far cry from China—a rival to American power whose economic might makes the thought of something like sanctions impossible. And unlike, say, Iran, Russia has no history of funding and arming proxy militias that directly attack American targets. This is not to say Putin doesn’t harm or have the potential to harm American foreign policy. By fomenting chaos to make himself the indispensable player in quelling that chaos, he can certainly complicate life for Washington. Joshua Yaffa is a journalist based in Moscow, where he is a contributor to The Economist and The New Yorker, among other publications. He is also a fellow at New America. Russia does pose the biggest challenge to American interests specifically and Western interests generally. Putin has set up his own primary role, and that of Russia, as an offensive bulwark against the U.S. and the West. We see this militarily in Ukraine, Syria and—through aircraft and submarine incursions—in Europe. Examples of economic warfare include interference with undersea electric infrastructure construction from the Baltics and Russia’s probing of vital undersea communications cables. In short, Russia is on a new Cold War footing; it again views itself as a global counterweight to the U.S., and is prepared to act as one. The fact that Putin is often playing to a domestic Russian audience in doing this does not alter the impact of his behavior. How to respond? First, we need to be cautious not to over-analyze nor over-respond to Russia. Are there areas in which a joint solution is possible—in Iran and in Syria for instance? Yes. But we do need to clearly define where interests diverge and be very tough in defending them. Those include Ukraine and cybersecurity, in particular involving energy, communications, and financial infrastructure. Steve LeVine is the Washington correspondent of Quartz magazine, an adjunct professor at Georgetown University and the author, among other books, of Putin’s Labyrinth: Spies, Murder and the Dark Heart of the New Russia. President Vladimir Putin’s willingness to flex his country’s military muscle has moved some to recast Russia as America’s biggest foreign threat. 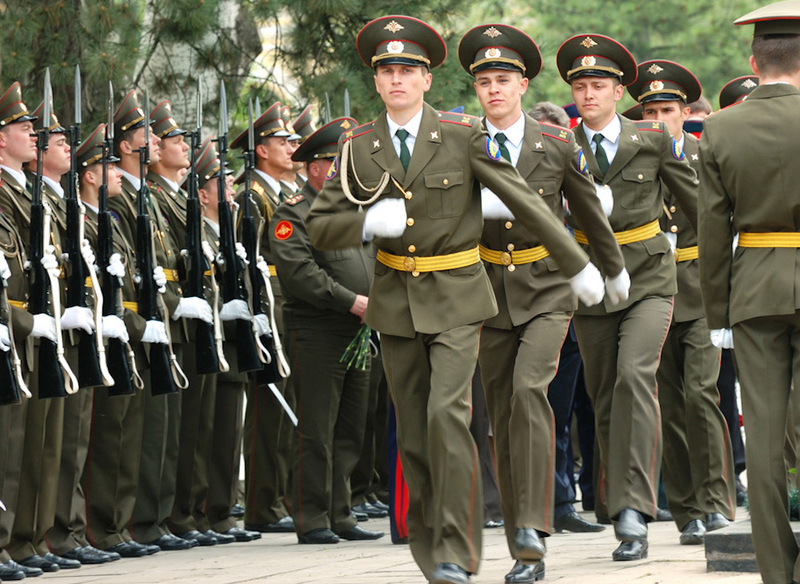 Russia’s activist military security policy and commitment to rebuilding its capabilities are unquestionably shaking up the geopolitical landscape. Putin’s defiant seizure of Crimea followed by his launch of airstrikes in Syria demonstrate his willingness to project force to serve Russian interests, whether these are protecting strategic assets or denting American prestige by daring intervention where the U.S. hesitated to tread. Putin has made it clear that Russia remains an international force to be reckoned with. But while some Russian actions may run counter to—and even damage—American interests, and its nuclear arsenal makes it a potential adversary second to none, the bigger foreign threat to the United States today looms in the conflagration in the Middle East. Weak states, intensifying sectarianism, and warring militias are enabling the escalating territorial expansion of the so-called Islamic State. The Islamic State is a new source of global terrorism, while the chaos its ambitions fans threatens to ensnare the U.S. in another generation of conflict. As Washington contemplates how it may move toward stabilizing the Middle East and battling ISIS, it may discover its interests are aligned with Moscow, however mephitic it may find this. Declaring Russia our biggest threat recalls simpler times that, against the tortuous threats we are facing, is strangely wishful thinking. Carla Freeman is director of the Foreign Policy Institute of the Johns Hopkins School of Advanced International Studies (SAIS) and an associate research professor in the SAIS China program. Russia doesn’t pose a substantial threat to America’s economy, energy, or environment. Russia stands out as a threat to the U.S. in two areas, nuclear weapons and the international order. But neither of these should be considered the biggest threat to America. Take nuclear weapons. Certainly, Russia is the only nuclear power able to physically eliminate the U.S. However, this has been the case for decades. Both the U.S. and Russia made huge strides to reduce their respective nuclear stockpiles, in Russia’s case from a peak of 40,000 nuclear warheads in the late 1980s to around 4,000 today. Yes, Russia is suddenly in the headlines because of its increasingly revisionist foreign policy, but compared with the intractable chaos of the Middle East or challenges posed by the economic and—inevitably—political rise of China, Russia is by far the more manageable threat. Moscow’s core aspirations are regional—maintaining influence in the former Soviet space and preventing further expansion of NATO to its borders. In the broader international arena, there are many areas where its interests actually coincide with those of U.S. These range from combating Islamic terrorism to non-proliferation of nuclear weapons and even, in the long run, containment of China. The truth is that Russia’s principal foreign policy concerns lie outside of the U.S. core national interests, while the remaining differences are manageable if approached from the position of a mutually acceptable compromise. Alexander Titov is a lecturer in modern European history at Queen’s University Belfast, in the United Kingdom. Medvedev had a point. After the 1991 collapse of the Soviet Union, Russian President Boris Yeltsin’s chaotic rush from socialism to capitalism was also a desperate effort to please Americans. Yet Hollywood swiftly updated the anti-Soviet classic Doctor Strangelove (1964) with the anti-Russian Air Force One (1997), in which a nationalist Russian psycho hijacks an American president (Harrison Ford). Russia remains a Hollywood villain; during times when American leadership stalls elsewhere—in Iraq, Syria, or world economy—Russia is a happy reminder of U.S. superiority in the Cold War. In 2008, with the economic crisis at its peak, Harrison Ford was still fighting the KGB in Indiana Jones and the Kingdom of the Crystal Scull. Vladimir Putin’s latest actions—annexing Crimea, destabilizing Ukraine and stepping into the bloody Syrian conflict—are the result, more than anything, of his Soviet KGB background. But did Hollywood’s overstatement of previous threats encourage Putin’s authoritarian turn? We know that after watching violent movies, some individuals emulate what they have seen. This gives the United States an unexpected opening. Barack Obama could reach out to former California Governor Arnold Schwarzenegger. Give “The Governator” a sequel as the U.S. special envoy to Moscow. Schwarzenegger personifies the qualities that the Russian president admires. The star of Kindergarten Cop (1990) could teach Putin how to be everyone’s policeman and everyone’s nurse, in a non-violent, non-threatening, Hollywood kind of way. Nina Khrushcheva is professor of international affairs at The New School. Her latest book is The Lost Khrushchev: A Journey into the Gulag of the Russian Mind. No, Russia’s real threat is to the status quo order in Europe. The Kremlin has long complained about American hegemony there. It was especially distressed by the expansion of NATO into former Warsaw Pact states and by NATO intervention in Serbia. The Color Revolutions in Georgia (2003), Ukraine (2004), and Kyrgyzstan (2005) seemingly confirmed a plot to establish American influence and control in the post-Soviet sphere. In response, Russia stepped up its cultivation of soft power through the media (like RT, a state-funded news network) and social networks. It backs conservative politicians and far-right parties throughout Europe. It invested heavily in modernizing its military. It exposed doubts about U.S. commitments to states seeking NATO membership through its brief war with Georgia (2008) and the current conflict in Ukraine. The present American response to Russia’s challenge is ineffective. Moralizing in foreign policy is a slippery slope, and Russia excels at pointing out American double standards and hypocrisy. Anti-Americanism is a potent force in Russia’s domestic politics; rather than fragmenting Russia’s elites, Western sanctions caused them to close ranks around Putin’s government. Even if regime change were to occur, there is zero chance that Putin’s successors would return Crimea to Ukraine. Fortunately, the Kremlin and the U.S. have no stomach for open military conflict with one another. The key for the U.S. is not to over-react to any single provocative act or utterance. Putin’s government has proven far more successful than the West at exacerbating Russia’s economic burdens and achieving its international isolation. Currently, it’s trying to sell Russians the notion that Russia is closer to China than Europe. Ultimately, it is up to Russians to decide. Paul Goode is senior lecturer of Russian politics at the University of Bath whose current research examines patriotism and national identity in Russia. He is the author of The Decline of Regionalism in Putin’s Russia: Boundary Issues (2011), as well as numerous articles. This question can be answered in four words: Islamist extremism and China. Since the end of the Cold War, not one American or Western European has been killed by Russian forces. Islamist extremists killed almost 3,000 Americans on September 11 and have planned attacks that would have killed thousands more. They have taken over a large part of the Middle East and North Africa and are threatening revolutions that would plunge the entire Muslim world into chaos and cripple the world economy. China does not pose such a dreadful threat, but it has or is about to overtake the U.S. economically, and has ambitions in the Far East that would end the U.S. role in an economically vital part of the world that America has dominated since 1945. Russia, by contrast, is a greatly diminished power that is struggling to retain the remnants of its influence in an area that was part of Russia for more than 300 years, and which until very recently was of no interest whatsoever to the U.S. One does not have to approve of Russian methods to see that Russia’s agenda in Ukraine poses no serious threat to the U.S. or key U.S. allies. As for Russia’s intervention in Syria, we need to remember that our real enemies are the same. Russia’s desire to prioritize the fight against Islamist extremism is one shared by many members of Western security establishments. Anatol Lieven is a professor in the war studies department of King’s College London and a senior fellow of New America. He is author of Ukraine and Russia: A Fraternal Rivalry. foreign affairs, international relations, Putin, Russia, U.S.